Krona is a fictional character that appears in comic books published by DC Comics. The character first appeared in Green Lantern #40 (Oct. 1965), and was created by writer John Broome and artist Gil Kane. As a member of the immortal Guardians of the Universe, Krona sought to create intergalactic order, believing the only logical way through knowledge. His thirst for understanding consumed him as he implemented perverse experiments to the detriment of the cosmos. Krona’s final procedure caught the attention of his fellow Guardians, whom expelled him from their ranks and imprisoned him on the desolate planet of Ryut. Vowing revenge, Krona passionately waits an opportunity to escape. The Maltusians, feeling guilty about not having stopped Krona, then argued how to deal with the results, eventually splitting into various groups (the Guardians of the Universe, Controllers, and Zamarons). However, Krona eventually escaped this fate and tried to start his experiment all over again, since the original machine had exploded before he could finish watching the universe being created. He was stopped by the Green Lanterns of Earth, Hal Jordan and Alan Scott, and banished into his energy form again. Eventually, however, Krona's energy form somehow reached the dimension where the souls of the dead in the DC universe await their passage into their final residences. This realm was ruled by a being called Nekron, Lord of the Unliving. Because of the paradox of an immortal now being in the Realm of the Dead, a rift opened between the dimensions, which allowed Nekron to see the universe of the living. Desiring it, but being too large to pass through the gap, Nekron instead recreated Krona as an undead being of enormous power. Given an army of similarly-restored spirits, Nekron sent Krona to kill the Guardians, so the rift would open more. Krona accepted because part of Nekron's plan involved collapsing the universe so as to recreate it according to his own desires, which would give Krona the chance to see a universe being born. Krona and his minions succeeded in killing some Guardians as well as several Green Lanterns while destroying the central power battery to preclude the Lanterns recharging their power rings. Although his subsequent attack was powerful enough to shatter the morale of the Corps, Jordan managed to inspire and rally his fellows to attack Krona with their remaining time of their rings' charge. He was defeated when Jordan entered the realm of the dead and incited the spirits of the recently-killed Lanterns to rebel against Nekron. This gave the Guardians enough time to banish Krona into the dead realm and close the rift while the spirit of Jordan's predecessor, Abin Sur, helped his successor escape the realm. In later appearances, Krona resurfaced as an agent of entropy itself (whether this contradicts the story in the paragraph above or not isn't clear). One of his attacks caused the New Guardians to vanish. During this adventure, apparently still an entropy-being, he destroyed several dimensions while trying to discover the secret of universal creation. Arriving in the Marvel Universe, Krona agrees to a cosmic game with En Dwi Gast, the Grandmaster. Two teams, one from each universe would seek out items of power, including the Ultimate Nullifier, the Infinity Gems, and Kyle Rayner's Green Lantern Power Battery. When Gast's heroes, the JLA won, Krona attacked the Grandmaster, despite the best efforts of the JLA and the Avengers to stop him. He finally obtained his secret from the cosmic entity Galactus, whom he killed. Krona then continued his onslaught to destroy both the Marvel and DC universes in order to create a new one, so that he could watch creation first-hand. Even with Superman wielding Captain America's shield and Thor's uru hammer Mjolnir, it was Hawkeye and the Flash who finally stopped Krona, imprisoning him into a "cosmic egg" from which a universe will be born in about a trillion years. The cosmic egg later reappeared in the pages of JLA. In this adventure, Despero has stolen the Cosmic Egg as a power source, and has been approached by Enigma (Anitmatter Riddler) and Morgaine Le Fay to reshape reality as the Dark Trinity, using the Egg as a conduit to warp the world with magic. When the spell fails, Krona is freed. 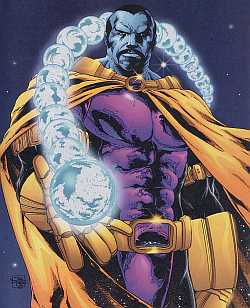 Following a lead he found during the Avengers crossover (stating all universes have consciousnesses and thoughts of their own), he contacts the Controllers to help him contact New Earth's. The Controllers are skeptical, and instead attempt to restrain Krona and study his energies. Enraged, Krona destroys the laboratory planet of the aliens and finds the planet's consciousness, "freed" from its prison of matter. Krona then sets out to do this to as many planets as he can, as to ultimately bring war upon the Universe's consciousness itself. Krona has returned to the mainstream DC universe in the wake of Nekron's defeat during Blackest Night and has been collecting all of the Emotional Entities for an unknown purpose. The first act of Krona's plan occurs with his abduction of the fear entity Parallax during the finale of "Blackest Night," imprisoning the creature within the confines of an ancient temple marked with the symbols of the Emotional Spectrum. Krona then proceeds to remove Ion from Sodam Yat, effectively turning Daxam's sun from yellow back to red and killing hundreds of Daxamites in the process. Over the course of the story arc, Krona is shown working with Hank Henshaw, telling him that enslaving and altering the qualities of the Alpha Lanterns will restore his mortality and also lead to the destruction of the Green Lantern Corps. In addition, he is shown working with the telepathic Zardor in his plot to brainwash rookie members of the Green Lantern Corps for his own purposes. Krona later appears on the Eastern Seaboard of the United States -- with an obedient Parallax in tow -- to Hal Jordan, Nicole Morrison, Larfleeze, Saint Walker and the Indigo Tribe, seeking to obtain both Adara and Proselyte for his entity collection. When confronting Jordan and the others, Krona reveals that, prior to his banishment by the Guardians of the Universe, he was the caretaker responsible for protecting the entities, and that is why he can control them and the abilities they possess. With the powers of the entities, Krona returned to Oa and used all the entities but Parallax to possess the Guardians. Krona placed Parallax into the Central Power Battery and in doing so, restored the impurity throughout the Green Lantern Corps and caused any Green Lantern to lose their free will and become slaves to Krona. Those who have been under Parallax's control in the past, however, are immune to Parallax taking over them again - specifically Hal Jordan, Guy Gardner, John Stewart, Kyle Rayner, Ganthet and Kilowog. The remaining Green Lanterns, sans Ganthet and Kilowog, were able to fight back by using the rings of the other Lantern Corps and freed the Green Lantern Corps, at the cost of killing Mogo. While the Green Lantern Corps were battling the possessed Guardians, Krona battled Hal Jordan and Thaal Sinestro. Despite Krona's greater power, Hal Jordan has a sudden burst of will that he unleashed on Krona which killed him and removed the Emotional Entities from the Guardians. Afterward, in spite of Krona's heinous actions, the Guardians decided to honor their former brethren, along with the other fallen Green Lanterns. However, Guardian Ganthet turned over Krona's corpse to the Red Lantern Atrocitus as part of a promise they had previously arranged. Genius-Level Intellect: Massive though incomplete knowledge on origin and creation of universes.